A compressor is a very overlooked effect guitarists can use to really enhance the quality of your tone. 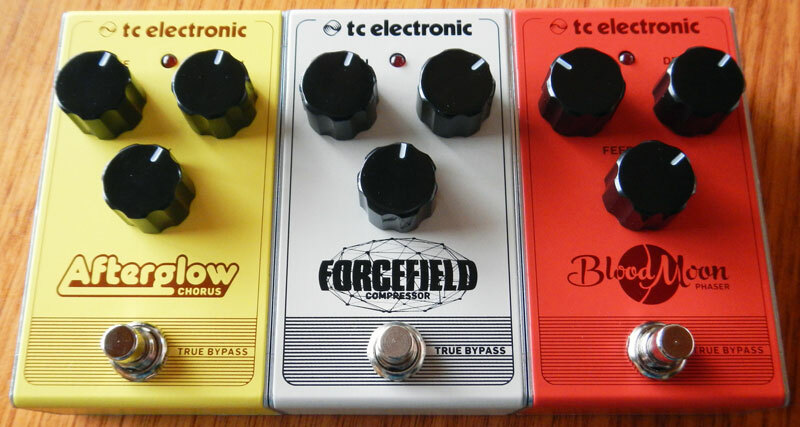 The Forcefield Compressor by TC Electronic is one of the 13 low-cost pedals from their new ‘Smorgasbord of Tones’ range. 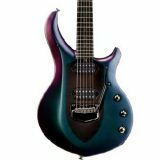 In this review I’ll give you a thorough look of the Forcefield and whether you might want one in your guitar rig. I thought it was worth mentioning that although the pedal shows 9V DC 100mA (see above right), the pedal only draws around 5mA. I don’t know why 100mA is printed on the pedal, but it definitely doesn’t draw 100mA. If you’ve never used a compressor before, it can be a bit confusing at first. It can be tricky for a first time user to figure out what each knob does without first understanding how compressors work. So if you’re considering buying a compressor, I highly recommend you first read through my Ultimate Guide on Compressor Pedals. Once you learn how compressors work, you’ll find them much easier to use properly. The Forcefield Compressor is a nice straight-forward guitar pedal. The three knobs give you a good amount of control over the effect while keeping things relatively simple. Once you learn the basics of compressors, it’s pretty easy to understand how to use the Sustain, Attack & Level knobs. As the Forcefield Compressor isn’t a TonePrint enabled pedal (the HyperGravity Compressor offers TonePrint), what you see is what you get: three knobs to control the effect. This means it’s an incredibly simple pedal to use, but it also means it doesn’t have anywhere near as much flexibility as other fully featured compressor pedals such as the HyperGravity. This pedal is part of the Smorgasbord of Tones range which is intended for guitarists wanting low cost and easy to use pedals. 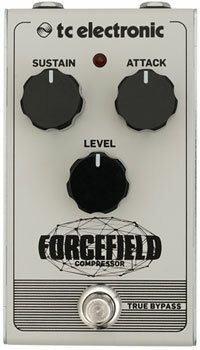 So if you’re looking for a simple pedal, the Forcefield Compressor is ideal. After plugging the Forcefield Compressor in, it quickly became clear why this pedal shouldn’t be considered a ‘budget’ pedal. 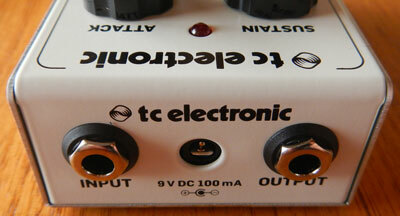 It produces really nice quality compression – much nicer than typical low cost pedals. While I’m quite familiar with compressors, I still found myself surprised at how good the Forcefield made my clean tone sound. If you haven’t used a compressor before, it can really enhance your tone and give it some spark and energy. I started off with a nice subtle compression and it added a nice warmth and clarity that was sorely missing. As I cranked the compression up, I was impressed with how the tone continued to be something I would use on a recording or in a live performance. There wasn’t any point where I felt that the Forcefield Compressor missed the mark in what a compressor should be able to do. Of course this is only a basic guitar pedal so it can’t match the extra level of control other compressors offer. Being able to blend the compressed signal with the original signal is a really nice feature to have and is unfortunately missing on the Forcefield. But adding another knob would move this pedal further away from being a simple pedal. In terms of sound quality, the Forcefield Compressor is fantastic for it’s low price. A beginner or intermediate who wants to get into using compressors would find this an excellent option. If you’re unfamiliar with compressors, you might want to check out the Guitar Effects Course available here to learn more. Find out how compressors work, when to use them and how to position them in a pedalboard to get the best tone. I was concerned at first when TC Electronic announced the Smorgasbord of Tones range. I’ve always considered TC Electronic to be in the higher end in terms of quality so when they announced a low cost range of pedals, I wondered whether the quality would suffer. Quite a few people wondered whether this new range would simply be Behringer pedals with the TC Electronic logo slapped on it (Behringer bought TC Electronic in 2015). It turns out many of the pedals in the range are upgraded Behringer designs. In terms of sound quality, while I don’t have a Behringer compressor to compare with, I would be very surprised if the Behringer sounds as good as the Forcefield does. I’ve tried 3 pedals from this range so far and each one has been impressive. So I’m not concerned anymore about quality problems. In terms of build quality, the pedal feels really rugged. It’s a clever design as all the pedals in the range use the same two piece build. It’s a sturdy casing and the knobs feel really secure. I only had right angle patch cables so had to purchase some straight patch cables to connect the pedals together (see different options for patch cables in my Ultimate Guide to Cables). I can imagine some beginners starting out by buying a few pedals from this range and ending up with a really neat and tidy pedalboard. Compared to other pedals in this price range, the Forcefield is built like a rock. The build quality may not be as refined as the HyperGravity, but it’s an excellent low cost build. If you’re looking for a low cost way to add a compressor to your rig, this is an excellent option. It covers the basics extremely well and is a well designed pedal. While it doesn’t match the flexibility and control offered by higher cost pedals, it’s a great starting point. Check out the current price of the Forcefield here. Who is the Forcefield Compressor for? If you’re looking for a low cost way to add compression to your rig or you want to find out how a compressor can enhance your tone, this is a great option to consider. It’s a very low cost pedal that will still give you great sounding compression. It’s incredibly easy to use while still teaching you how compressors work. Who isn’t the Forcefield Compressor for? If you want full control over your compression, the Forcefield Compressor isn’t for you. I would recommend either checking out the HyperGravity Compressor, or read through my recommendations in my Guide on Compressors. Start off by reading my Guide on Compressors to really learn how they work and how to use them. It’s really hard to figure out how to use a compressor by randomly turning the knobs. So start off by learning what each knob actually does to your signal. Then you’ll be able to dial in the right compression for each situation. To really get the most out of a compressor, you need to understand how they work and how they interact with other effects pedals. For example, should you place a compressor before or after an overdrive pedal? What about a chorus pedal? What if you’re using a clean tone? 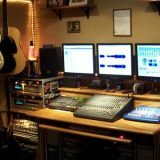 The Guitar Effects Course gives you a complete picture of compressors as well as all other common types of guitar effects. You’ll find out how they work, what each effect sounds like and how to combine them in the right order on a pedalboard. If you’re just starting out with a compressor, this course is a good place to learn everything you need to know about them. A good option to consider is the HyperGravity by TC Electronic. 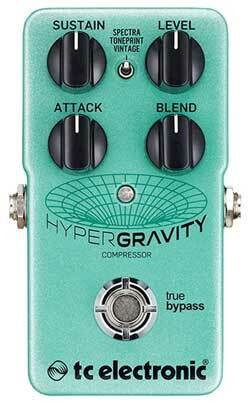 If the Forcefield Compressor is the entry-level version, the HyperGravity is the real deal. 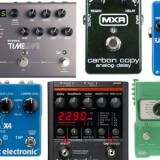 Alternatively, check out some alternatives in my Guide on Compressor Pedals here. I compare a few different compressors and why each one may or may not suit you. 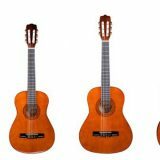 I normally provide a link to Amazon at this point, but the Smorgasbord of Tones range isn’t currently on Amazon. 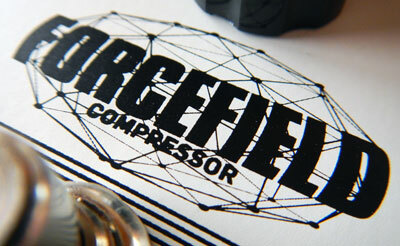 So check out the Forcefield Compressor page on the TC Electronic website for more details.